Tables may be fitted with armrests and rigidly supported sliding side shelves just above the table top. The sliding shelves must be used in conjunction with a front support bar and a rear support bar that are fastened to the table legs. The bars can be retrofitted, but cannot be used with the full perimeter enclosure or Faraday Cage. This adjustable steel rail mounts on the table’s front legs. It has a slot in which the shelves mount, and is normally ordered with the armrest pads. The bar may be centered along the length of the table or cantilevered to suit your application. 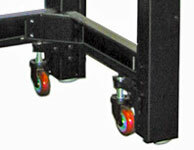 This adjustable rail mounts on the rear table legs and supports the rear end of the sliding shelves. It may also be cantilevered. Adjustable leather forearm rests which fasten to the front support bar. A new armrest pad is now available which fastens to the perimeter enclosure. Shelves are made of wood with white plastic laminate covering all sides. A metal bracket on the front edge of the shelf fits into the slot in the front support bar. Shelves slide freely from side to side and are easily lifted off the support bars. Built-in stops prevent shelves from sliding out of slots. When ordering sliding shelves, you must order front and rear support bars. The 14 in. (350 mm) deep raised rear shelf mounts on the full perimeter enclosure and is the length of the corresponding table top. The shelf is solidly supported 18 in. 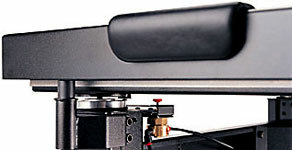 (450 mm) above the isolated surface with no direct noise transmission to the table top. NOTE: This shelf cannot be used with the Faraday Cage. For additional storage space, a shelf mounted beneath the isolated table top is available and may be retrofit at any time. A fixed, welded-steel structure that completely surrounds the table top to provide non-isolated support for Faraday Cages, raised rear shelves Plexiglas enclosures and other special fixtures. Cannot be used with sliding shelves or support bars. To minimize bottled air supply usage, standard TMC height control valves have a small “dead band,” resulting in a height return accuracy of ±0.05 in. (±01.3 mm). Precision valves control height to within ±0.005 in. (0.13 mm) but have a slight, constant leak. To specify precision height control valves with a table, add the letter ‘P’ after the basic table model number. Precision valves may also be retrofit to installed tables. Images and Text Copyright TMC, reprinted with permission.